Hello, this is Andie Arthur, executive director of the South Florida Theatre League and I am here with Off Stage Conversations, where I take a look at what's happening in the national and international theatre community. When we talk about graying audiences, we often lament that kids these days don't get enough arts education. Mike Lew makes a really compelling case on why better arts education won't save theatres that have a problem with hospitality. The whole article is full of really smart discussion on why we should stop bringing out this whole platitude and what we can do to engage the audiences we want. When I was in NYC for the Dramatists Guild Annual Meeting, I saw Sleep No More. I was incredibly intrigued by it, since this sort of immersive theatre is what is super trendy in theatre right now and all but non-existent in Miami. Even something as delightful as The Strange Undoing of Prudencia Hart, which toured through her in February, seems fairly traditional from the completely immersive environment of Sleep No More. So I've spent the past month trying to find great articles that can place that experience into context. And eventually, I might try my own hand at figuring out why no one has tried this in Miami. (Besides money. Because that couldn't have been cheap.) Diep Tran writes for American Theatre Magazine on the entire phenomenon of immersive theatre, and Megan Reilly talks about in depth about issues with the audience in Sleep No More. 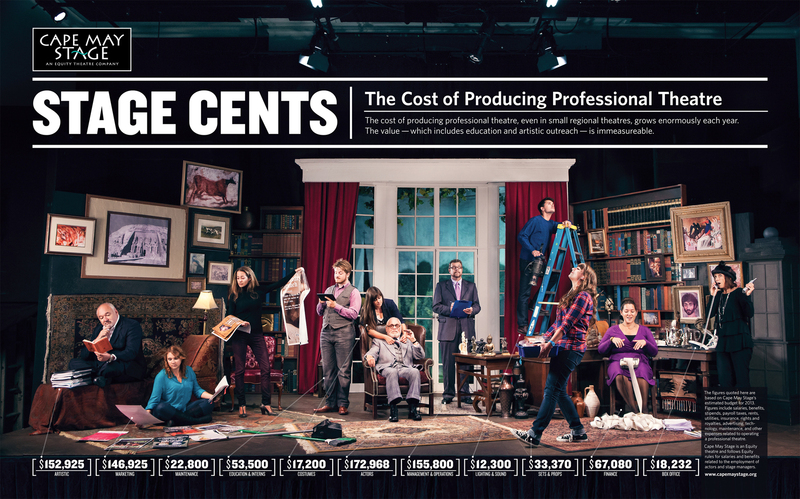 Cape May Theatre has a really lovely info graphic detailing their annual budget in a way that should really connect with their donors. We tend to be great about saying these things to our donors, but a picture of a beloved production with details makes an even stronger case. Wendy Rosenfeld talks about why critics should be involved in the discussion of diversity in the theatre community and how that is a part of their role in the theatrical landscape. If I, Ms. Theater Critic, attend your theater and see a good but traditional production of The Odd Couple, or maybe Glengarry Glen Ross, or especially, Lend Me a Tenor, I am obliged to explain how and why this production works. However, as a critic tasked with analyzing the work in its larger sociopolitical context (Why this play? Why here? Why now?) I am also obliged to wonder, in print, why you’re producing these old ringers, and how, in the case of the third example, you can in good conscience, in a city whose population is 58 percent African American, present a farce whose conceit relies on blackface and an Afro wig, unless you are deliberately thumbing your nose at the neighbors. The Guardian interviews Jon Fosse, a prominent Norwegian playwright, who is one of the most produced playwrights in Europe -- but practically unheard of in the UK (or America).